Have you tried the new Google Keyword Search Tool yet? Do you ever get stuck thinking of new keywords related to your website niche? The Wonder Wheel uncovers a never ending supply of good keywords so you will be able to increase targeted web site traffic. When you get stuck finding the perfect keyword then take this baby for a joy ride! You definitely need to spend some time playing around with Google's Wonder Wheel. This nifty keyword search tool is going to take your burnt-out list of keyword on an exhilarating, revitalizing and thrilling wild ride on a Wheel-of-Wonder created especially for keyword starved webmasters! 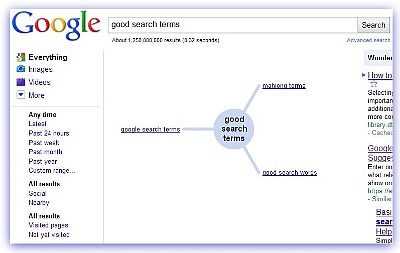 Enter a search term to bring you to Google's Search Results Page. 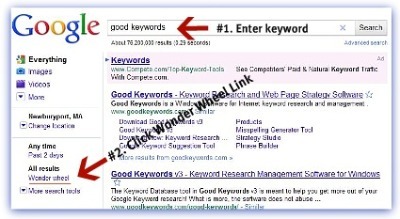 Type a keyword term into the search box to activate the Wonder Wheel. 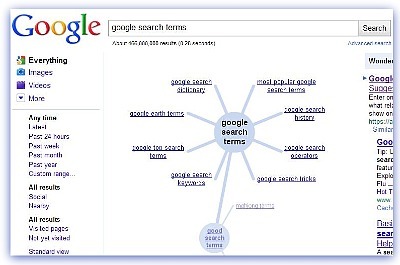 The search term will appear in the center of the wheel with a selection of related keyword options surrounding it. Here's how you mine for those nuggets of keyword gold. . . I'm going to select one of the related keyword options that the wonder wheel revealed, "google search terms" which starts a deeper search for related terms. The Wonder Wheel goes around all over again for another wonderful keyword discovery joy ride. . . It's like a hidden treasure chest full of beautiful keywords! Just imagine how deeply you can dig for the most precious, good keywords on your web pages so your site is found first when visitors are searching for information related to your niche! This site building search tool features a variety of great functions as well as a very helpful keyword search feature that accesses several different data bases like Google Adwords, Work Tracker, Overture and Yahoo. Another function of Search It! 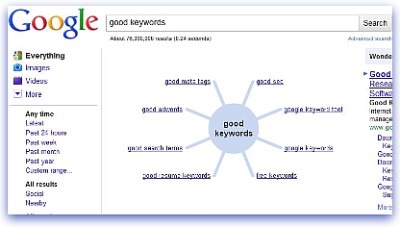 provides the estimated worth for each keyword as well as identifies supply and demand. That way you know that you are selecting the most profitable keyword with the least demand so your web page will be first in search engine results and earn you more in adsense clicks!